Dentist Lawrence: What Causes Bad Breath? The first step towards kicking your bad breath to the curb is understanding what causes it in the first place. #1. You aren’t taking proper of your mouth. Practicing effective oral hygiene technique is one of the best things you can do to keep your breath fresh, and those who forget to brush and floss on a regular basis will experience bad breath. This is because bacteria can start to grow around your gums, in between your teeth and on your tongue, and over time, as the colonies of bacteria increase and biofilm develops, a foul odor will be produced. #2. You have dry mouth. Bad breath is one of the many symptoms of dry mouth, also called xerostomia. Your mouth depends on saliva to neutralize acids, as well as to wash away dead skill cells that can start to accumulate on the gums, tongue and cheeks. These dead skin cells will start to decompose if they are not washed away, and this can cause bad breath. Often, medications can be cause of dry mouth. It is important to discuss with your pharmacist the side effects of the medications you’re taking. If you do have dry mouth, talk with your dentist about ways to manage and improve your saliva production. #3. You have a stomach problem. It may surprise you to learn that there are many stomach problems can cause bad breath. Gastroesophageal reflux disease (GERD) or acid reflux, is just one example of a stomach problem that can cause bad breath. Some symtomps are sour/acidic taste in the mouth, heartburn, bad breath, chest/stomach discomfort and tooth erosion. The acid from your stomach can damage to your teeth can make it possible for bacteria to start to grow in your mouth, possibly causing decay and bad breath. #4. You have a systemic infection. Did you know that bad breath could be an indicator of many different systemic infections? Specific odors in your breath could indicate specific health concerns. For example, if your breath smells like ammonia, it could be a sign that you have liver disease and if there is a fruity or sweet smell to your breath, it could be a sign of uncontrolled diabetes. If you are concerned about this, please consult with your dentist and physician. #5. You have gum disease. Gum disease, also called periodontal disease, occurs when you don’t properly remove the plaque on your teeth on a regular basis. Bacteria can grow on this plaque, and it can cause an infection below your gum line. One of the most common symptoms of periodontal disease is bad breath. Even though periodontal disease is often not painful, it can cause significant damage to the gum tissue and bone that support your teeth. It is critical to see your hygienist and dentist regularly so that they can monitor your periodontal health and keep your gums and teeth healthy. Sometimes, bad breath can be explained away by what you ate or drank that day, but if you are experiencing bad breath on a regular basis, it could be a sign of something more serious. 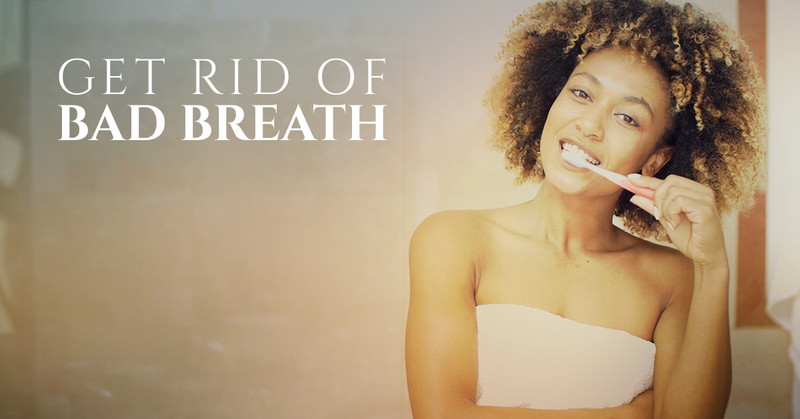 Don’t just cover up your bad breath with a stick of gum or a swig of mouthwash. Instead, schedule your appointment with our dentist in Lawrence to treat the source of your bad breath!